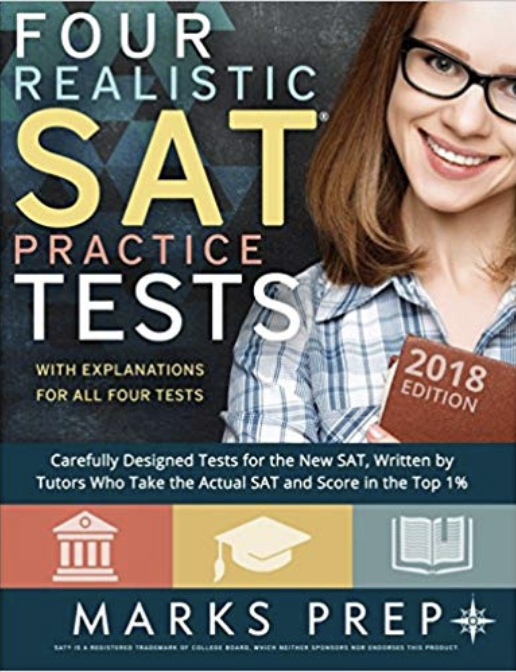 This book has four full, accurate, realistic practice SAT tests that closely model the experience of taking the real SAT. 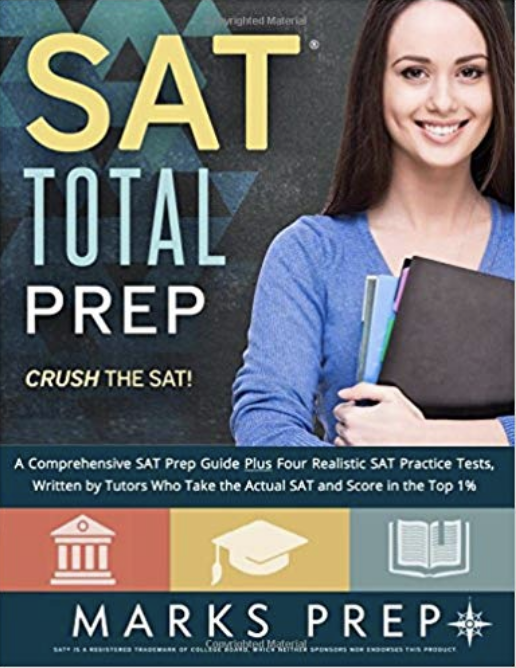 *This book combines the resources that can be found in our other two SAT prep books. After one of our meetings with Shivani, I filled my husband in with her follow up memo from the meeting and subsequent email and conversation, and he said, ‘Shivani is worth her weight in gold! !’ I share the sentiment. Our experience at Marks Education was exceptional across the board. Ryan Blodgett did an outstanding job of preparing my son for the ACT and the SAT Math 2 Subject test. Highly recommend. Shaun Stiemsma is really a gem! Not only is he knowledgeable and exceptionally talented in what he does but also a good man. No wonder the kids do so well! Sarah helped me develop techniques that allowed me to manage my time during the test and avoid making common, unnecessary mistakes. The score I received on my most previous ACT was a whole five points higher than my first score. I could not be happier with my experience at Marks Education. Working with Nisha was a great experience. I attribute a great deal of my acceptance to my top choice medical school to Nisha’s insight and ability . . . Thank you, Nisha! I had an excellent experience working with Marks Education. Being a recruited athlete, I had a particularly rushed and unique timeline towards the end of the process but my counselor, Hugh McIntosh, was fully invested and made himself available multiple times per day in addition to reviewing my essays and application online many times. I am so grateful for all of their help throughout the entire process and thrilled to be going to my top choice college next year. Anthony Celino is an amazing tutor and also a very nice person who works well with both the students and their parents. He is able to discern from practice tests where the student needs to focus his/her efforts in order to improve standardize test scores and tailors the tutoring sessions to systematically tackle weak areas. The improvement in test scores is proof of his effectiveness. I highly recommend him. The skilled professionals at Marks Education gave us tailored, comprehensive, strategic care and support throughout the grueling U.S. college application and admission process. Not only did our son dramatically boost his grades and test scores, but he also improved his study skills and overall confidence. The team at Marks Education was very helpful to my college application process. The planning of my high school class selection, provided by Nina Marks and Ian Perez was especially helpful. My essay advisor, Hugh McIntosh, worked with me to refine broad ideas to concise, strong personal statements and supplemental questions. The fall of senior year is inevitably a difficult time, but Mark’s Education made it clear and painless. Thank you, Anthony . . . I can tell that you genuinely care about your students, the characteristic that separates a good teacher from the rest. I have enjoyed, and continue to enjoy, working with you. Working with Hugh was incredibly helpful. I went into the essay process intimated by the vast number of essays and worried that I wouldn’t have anything to write about. Hugh broke the process down so that writing countless essays seemed simple. He was also really helpful in the brainstorming process. With regards to the writing process, Hugh always offered constructive and insightful criticism that helped me write essays that I was really proud of. Most importantly all of his advice worked and I got into my first choice college! Dan Hertz has been an energetic, effective, and invigorating math tutor for our daughter Vanessa. Not only has he reviewed, clarified, and taught key concepts clearly and concisely, but he has also offered constant guidance and provided positive reinforcement regarding the necessity of good sleep and nutrition habits. We are thrilled with the superb assistance our daughter received from Robert Clark. We are more than pleased. Not only with the results, but with what he taught our daughter about her writing, and about herself. THANK YOU! I am thrilled with the results of Dan Bloss’ ACT tutoring and wholeheartedly recommend him to any college bound student who wants to significantly increase his or her scores! Getting the opportunity to work with Nisha Sardella turned the stressful and scary experience of applying to law school into a genuinely enjoyable one. She is extremely smart, confident, funny, and friendly. What’s more, she genuinely understands how nerve-racking the process is and is immensely supportive. Her expert experience was evident from the first meeting that we had. Marks Education improved each of my applications significantly, through editing, proofing, and very thoughtful suggestions. What’s more, Ms. Sardella and the rest of the team at Marks Education just knows how to navigate the process: they know how to break down each step, each objective, and each aspect of what applicants must deliver. I am extremely pleased and grateful for Marks Education and their tutors Eddy and Sarah. Both have helped my son not only get his grades up, but they have helped him to get organized, focused, and thinking beyond what is due tomorrow. In addition to Marks Education’s sage advice on the entire application process, they did a terrific job of drawing our son into the process and helping him take ownership of his college applications. We had nothing short of the best college prep experience with Marks Education and in particular, with Susannah. From the beginning, she helped us navigate the college admissions process and worked with us to identify the best schools for our son to consider. Susannah was always available for questions and advice, even in the middle of college tours when our questions were time sensitive. Because of the detailed timelines Marks Education provided, we knew our to-do’s well in advance and our son had ample time to prepare his applications and essays. Susannah’s feedback on his application details and essay drafts was quick, thoughtful, and incredibly helpful. He ultimately settled on applying Early Decision to his first-choice school, which Susannah helped us determine by matching his profile and interests; her insights and suggestions lead us far beyond the information we researched on our own. Most importantly, Susannah made the admissions process significantly easier to understand and navigate, which in turn eliminated the tension and stress otherwise associated with applications. As parents, we really appreciate how calm she made us, and more importantly, how comfortable she made our son. Susannah established a terrific working relationship with him, and he was happy to reach out with questions and concerns of his own. As our younger children make their way through high school, we can only look forward to working with Susannah and Marks Education. 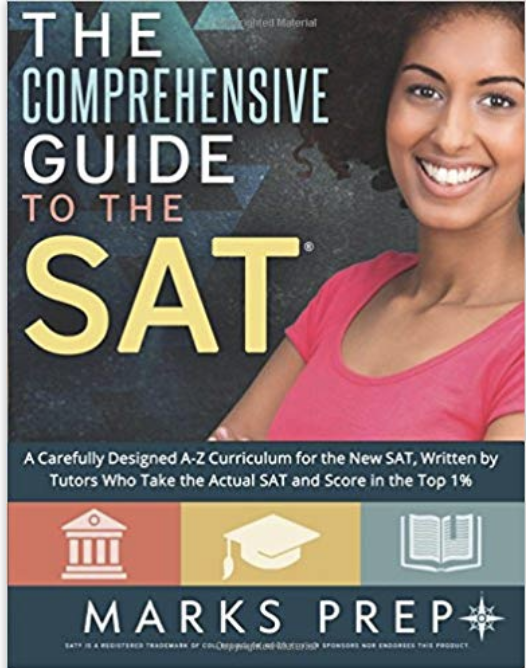 When our daughter saw the results of her SATs she exclaimed, “Nitin is a god!” While we wouldn’t put it that way, we were equally happy, not only with the SAT and AP outcomes, but also watching our daughter approach the tests with calm confidence instead of high stress. We highly recommend Marks Education and truly believe you will find them wonderful to work with. We only hope that they have the opportunity to help your child as they did ours.